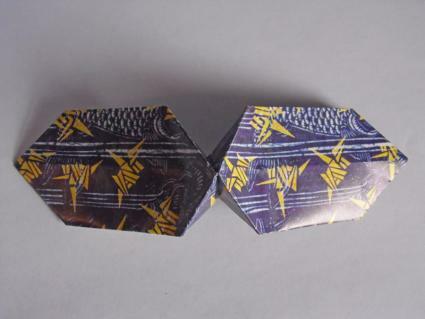 Origami bow ties are a clever example of wearable origami art. They won't last quite as long as one made from fabric, but they are perfect for use as whimsical dress up props. 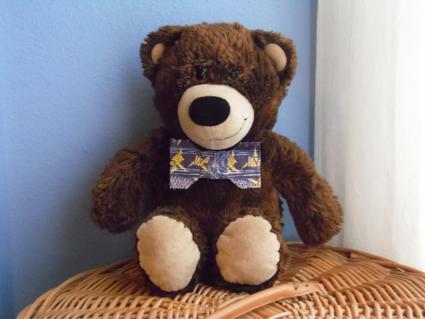 You can make a bow tie for yourself or use an origami tie to dress up a child's stuffed animal so Mr. Bear is properly attired for tea time. 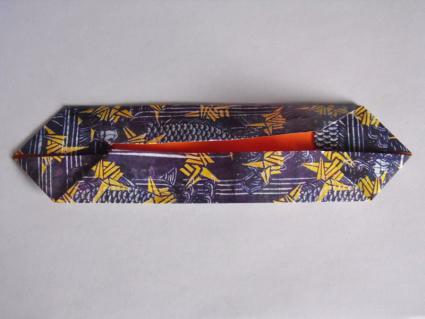 To begin making your tie you'll need a single sheet of origami paper with the desired color or pattern. The size of the square you should use depends on how big you want the bow tie to be. Using a 6" x 6" square of paper will result in two bow ties that are about 3" x 1 1/2". Using an 8" x 8" square of paper will result in two that measure 4" x 2". The paper in this tutorial is an 8" x 8" square. 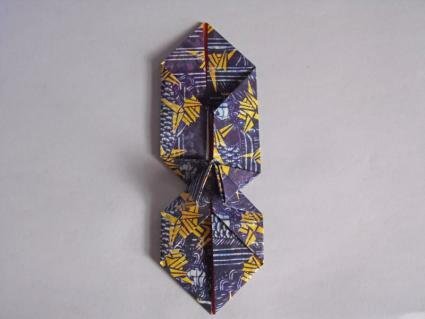 Fold the paper in half, then unfold. Cut down this line to make two rectangles. You can either make two matching bow ties or save the other half of the paper for another project. Place your rectangle in front of you with the patterned or colored side face down. Find it in half horizontally, then unfold. Fold each of the four corners in to meet the center crease as shown. Fold the top of the paper down to meet the middle crease. 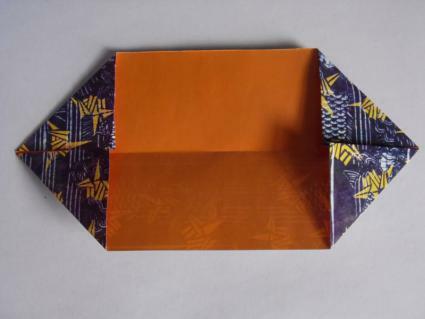 Fold the bottom of the paper up to meet the middle crease. Fold your paper in half vertically. Rotate it 90 degrees so the pointed end is on top. Fold the bottom left and right corners in to meet the middle crease. Unfold your paper. Use the crease lines from the last step to collapse the paper, using the same technique used to create a waterbomb or preliminary base. Place your paper in front of you with the two open ends at the top. 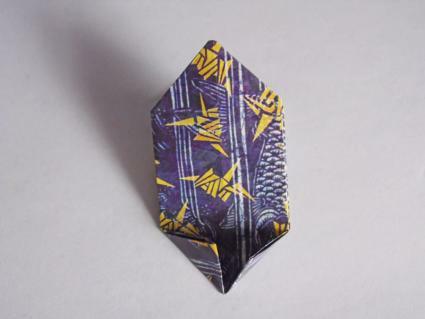 Fold the top layer down, creasing at the base of the bottom triangle point. Fold the left and right corners formed by this fold in to meet the center crease. When finished, your paper should look like the photo below. Flip your paper over. Fold the top layer down, then fold the left and right corners formed by this fold in to meet the center crease. Rotate the model 90 degrees. Gently pull open the flaps. 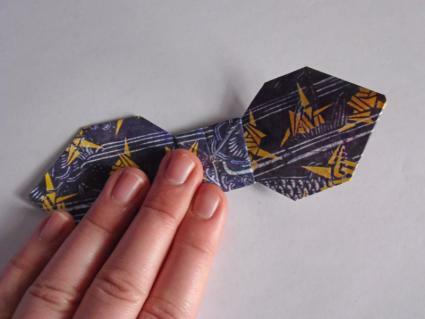 Collapse the center of the origami bow tie by applying light pressure with your thumbs. If your paper is very thin, you will need to be extremely careful not to tear or rip the paper while completing this step of the project. 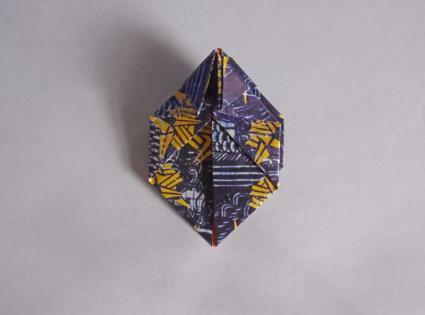 Fold the pointed left and right corners to the back of the paper to blunt the edges of the model. If desired, make a few light horizontal folds on each side of the bow tie to add light wrinkles and give a little added realism to your project. Your origami bow tie can worn as a real bow tie if you add a self adhesive pin back to the finished model. Making a bow tie from a large square of scrapbook paper and gluing a wooden dowel to the side creates a fun photo prop. You could also try adding your tie to the front of a homemade greeting card or using it as a decoration for a scrapbook page. A bow tie is a fun model to learn to fold, but is more complicated than most beginner level origami projects. Do not get discouraged if your first few attempts look less than ideal. With practice, you'll eventually be able to make a bow tie suitable for any occasion.